Inspired by the duality of both the simplicity and the complexity of mathematical wireframes, these Tetra cufflinks are a mathematical marvel to the eye. A classic shape reinvented, these cufflinks embody timeless elegance and are a refined mix of industrial minimalism and sophisticated masculinity. As simple as a shape can be, its wireframe plays tricks on the eye, making it either complex or simple when viewed from different angles. 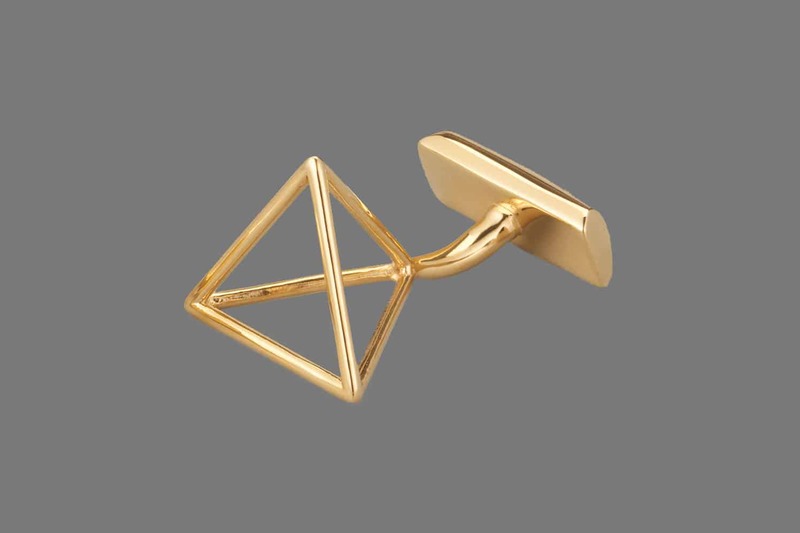 These geometric cufflinks are a timeless finishing touch to any look. 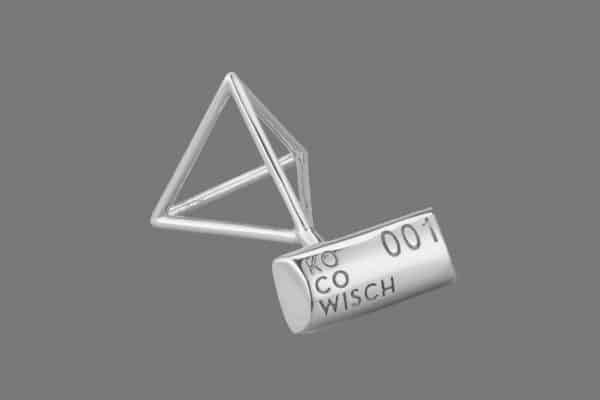 According to some, this shape, also called Tetrahedron, triangular pyramid, Euclidean simplex or simply pyramid, has healing and preserving powers. These powers are said to preserve foods, maintain the sharpness of razor blades, improve health functions or trigger sexual urges. We honestly don’t know about that, all we know is that these cufflinks have the power to make you look ravishing on every occasion. 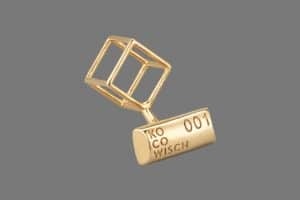 Each cufflink is made through a process where the oldest and newest techniques of gold smithing meet. The cufflinks are made using the ‘lost wax casting process’. A 3D printed positive model in wax is covered in a ceramic coating, which is then heated to melt the wax, leaving a hollow mould to be filled with a molten metal of your choice. After cooling, the cufflinks are hand polished, plated with a metal of your choice and hand polished again. All cufflinks are available in 18 carat gold plated and sterling silver. 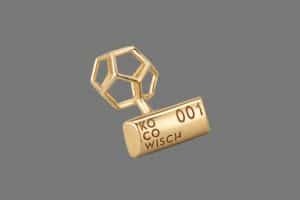 Each pendant is numbered with a unique serial number and comes with a certificate of authenticity, guaranteeing the exclusivity of the item. 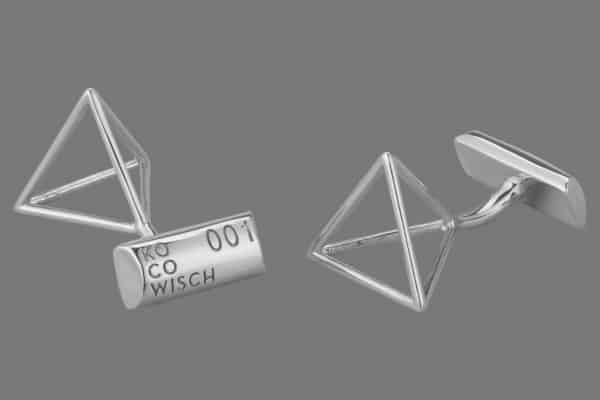 You can also choose to have your initials cast on the cufflink, instead of the serial number. Please choose the “initials” option and fill in your initials (a maximum of 3 initials), so we can make that happen. All jewellery forms part of the Kocowisch Kocohedron collection, an ode to the beauty of mathematical wireframes. The collection consists of Led light fixtures, pendant jewellery for women and accessories for men, like cufflinks and studs.